New Code! This fixed the issue with the >35 days (50339 MySQL time issue). Feel free to ask questions, thanks. Where to add the large block of code was not apparent. Cannot get the Age column to sort. … it seeems to sort on something but not on age. Did you get the $sortOptions code in and the original commented out ok? If so feel free to just email me your file and I’ll take a look at it. scott (at) sudobash (dot) net. This worked for me, let me know if it works ok for you. Code has been updated in the article. thank you for your Mod and support. All other mods are done, only this code is missing. Then comment that out and add all that code right below it. Great stuff 🙂 works perfectly. Its a must-have function that should have been implemented as standard. Thanks! Glad it worked for you. Also, I believe the function is included in 1.7 (whenever its finally released). Hello, I did this but now I have a problem caused by this modification. I need to return the column ticket on the tickets to make an white collor when we don’t interact with it and bold, when interact. Double check your work, this MOD has no effect on that. Perhaps you overwrote too much of the code? Where should I put the long code, what file and what line? I am trying to add this function to my client end ticket view. $diff = round($diff / 125400); is a number I came up with through trail and error. Any idea how to make this truly work. The following is my complete code. Some of my code got scrubbed out of my reply so please check the full code link. The following code will calculate age of closed tickets. Awesome, Pedro. Thanks very much. I have updated the code in the tutorial. I’m having a bit of trouble with this one. All seems well on the open ticket display. Age is displayed appropriately. The trouble for me comes on the closed tickets. The Age of the ticket when it was closed is displayed, but the sort seems to be by date created, not by the tickets age like the column would indicate. It’s a bit confusing since the column isn’t there to judge how it’s sorting. How can I have age of the ticket show on the open tab and have created on, closed on, or simply omit the column on the closed ticket page. Hopefully my ramblings make some sense. Then how to alter this MOD? Having troublw with this one.. The tickets aren’t aging or at least not showing it in column , all i get is a “0” for age..
cannot find a mistake, do notice that ticket list view has dropped down from the REFRESH button by quite a way.. only on pc, mobile device is ok ???? Hey Kaj, thanks for the note. I’ll try and give you a hand when I have time but it might be awhile as I have a full time job plus a part time contracting job right now (not to mention 3 kids and a family to give some time to.) I’ll take a look at it when (if) I get some time. I’ve been using this mod for sometime and its great, thanks for building it! I’m wondering if it’s possible to have the age include the last reply from notes. 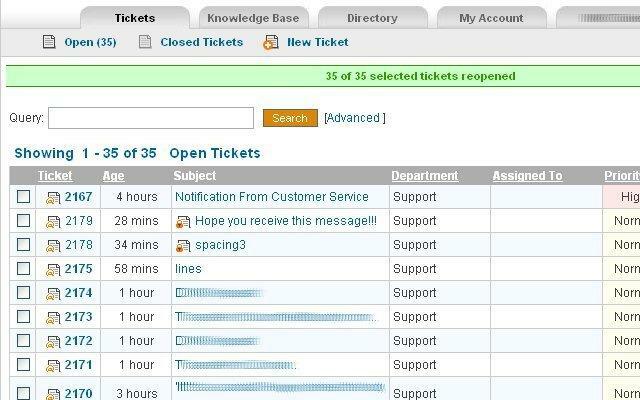 Quite often we have tickets that are internal in nature and staff are adding information to the internal notes but not replying to customers so the ticket doesnt show as being updated. Is there a way we can include internal notes to show the last time since any reply to the ticket, be it internal or a message. Barry, thanks I’m glad it’s working out for you! Anything is possible so long as you have the data! Unfortunately, I don’t have the time right now to code something up. You may want to ask for assistance on the forum and see if maybe someone else has some time to work on it. I got “500 – Internal server error. There is a problem with the resource you are looking for, and it cannot be displayed.” every time I have tried to add your age MOD or age + assigned to MOD. Can you help me with both? Do you have access to your Apache error log? Great code, but where do I change the code so the tickets are sorted with the most recent ticket displayed at the top of the list? I believe it’s sorted by default by ticket ID number which means the newest should already be at the top. What’s currently occurring for you? doesn’t seem to be sorted at all. A satisfied customer (again). Thanks, Scott, for collecting and maintaining this code. I made some changes to the bottom part of the big block – not functional changes, but to make the code cleaner. I replaced the less-than-or-equal with a “less than one higher”, and I cleaned up the elseif (each evaluation would get hit only if the prior one failed, so there is no need for the lower boundary check). Again, your code works just fine – this is the picky proofreader in me coming out. When i create a new ticket it shows me 15645 days instead of 0 minutes. My date settings are correct. Also, the age header is displayed but still date created is getting shown in that column. Also one count with value 15644 is showing up on the top of the table displaying the tickets. Please help. where we can put this code ? If you are just updating your code to make this work then just overwrite what’s in the following box with what you currently have. Does this ticket age mod work in v1.7.2?